It’s about 9:00 in the evening on July 12, 2008. The stars are brilliant overhead and the glaciers are gleaming white above us on top of Kilimanjaro. 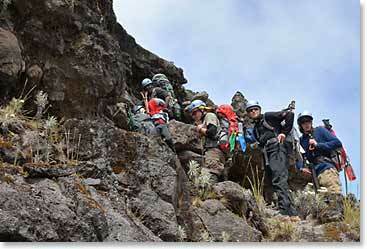 The day that the teams cross the great Barranco Wall is usually a day that causes a lot of anxiety for the BAI teams. That’s a peak trail that leads up over the great Barranco but this Huffines family (ages range from 11 to 50) team scampered up over the Barranco like they were a Huffines family mountain goat team. Everybody had fun, enjoyed the scenery and movement. We put our ski poles away and our climbing helmets on and ascended the 800 ft. with no problem at all, I think everyone thought it was fun. You know it was only one week ago tonight that the team landed in Africa at Nairobi at the airport. The adventures they have had, the learning that has taken place since then makes it seem like much longer than a week, but in many ways, our journey is just beginning. Now we’ll be moving up higher on Kilimanjaro getting in place for our summit. The team looks strong; they are excited about all the upcoming adventures not only on Kilimanjaro but on safari in Tanzania. Stayed tuned, we are doing great and we look forward to giving you reports as we move along.